It has become a cliché that “the router is the most versatile tool in the workshop” but this is only true if it does the work that you want it to do. To the uninitiated all routers look much alike but the difference is in the details and the details make all the difference. This article sets out the various factors to take into account when choosing a router. The overriding factor will be what sort of woodworking you want to do. If your main interest is toy making or small boxes, you will not want a cumbersome heavyweight. Conversely, if you are working commercially, making kitchen cabinets, fitted wardrobes etc. the lightweight DIY models won’t be much help. 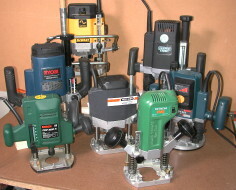 You need adequate power to meet your specified woodworking goals, but the benefit of high power has to be set against the disadvantage of using a heavy router for handwork. If, however, you plan to do much work with the router mounted in a table, the more power the better because routers tend to be worked much harder in a table. For all but the lightweight models, variable speed is an advantage. It gives more versatility in the use of larger diameter cutters, and enables other materials such as plastics and alloys to be cut at the correct speed. In addition you get the great benefit of a ‘soft start’ when you switch on. With a heavy-duty router, bought for general use, I would not consider a single-speed model. As far as I am concerned the simpler the switch the better. Switches that cannot be locked in the ‘ON’ position create problems for some hand-held operations and for table routing. For heavy-duty work, especially in a router table, the larger the base aperture the better, to allow large diameter cutters to pass through and to give good visibility when working. The best collets are precision made from tempered steel, and taper to fit into a tapered motor shaft. Poorer collets are made from a cone-shaped lump of steel which is often too shallow to grip much of the cutter shank, wears quite quickly, causes cutter chatter, and makes hard work of the cut. A few routers allow the collet to be plunged through the router base. This is invaluable in regaining the depth of cut lost when the router is used in a table or with a guide bush and template. Manufacturers’ specifications rarely give any information on this vital point. Their ‘plunge depth’, simply tells you how far the router body travels up and down on the plunge legs. If the collet can be plunged to touch the bench top, you can’t really complain. Anything deeper than that is a bonus, but anything much shorter could create problems with some operations. There are two basic methods of locking the plunge: a twist-knob handle or a separate clamping lever. The general rule is twist-knobs on light-duty routers, separate levers on heavy-duty routers and either on medium-duty routers. My experience is that the more you use a router the more you favour the separate clamping lever. The two main types of handle are knobs and side levers. The latter give more leverage and are almost always the type found on heavy-duty routers. Handles are also all the better for being just that – without also carrying the switch, or the plunge lock, or both. Most router bases are fitted with a plastic facing plate. If this is removable it can be easily replaced when worn. Additionally, most bases have threaded holes to take screw-on accessories or to attach the router to a table. Some have only the guide bush holes, which may not even be threaded these days. 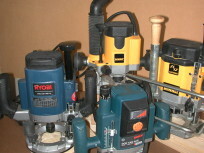 Such models, especially if they are heavyweights, restrict the choice of router table. A side fence is a standard accessory with all routers. A substantial fence, with removable rods, adjustable cheeks, and a fine adjuster is desirable. This is less important if the router is bought exclusively for table use. A good range of guide bushes is a very useful but greatly underrated feature (unless the router is bought exclusively for table use). Fortunately, for any model lacking its own range of guide bushes, it is always possible to buy or make an auxiliary sub-base to take another manufacturer’s guide bushes. Virtually all manufacturers offer some form of dust extraction connector, usually as part of the standard kit but occasionally as an optional extra. Good-intentioned as these are, it has to be said that the best extraction, by far, comes from building it in to the router. There are only one or two such routers at the moment but this is clearly the direction in which router development is going. With some of the existing systems, fixing the extractor spout to the router base effectively destroys any visibility through the base. Extraction is a different matter with a router table, however. It goes with the table rather than the router and is much more user friendly. You might not pick up all the dust but at least you are not struggling to avoid tripping over the hose, and you can still see what you are doing. 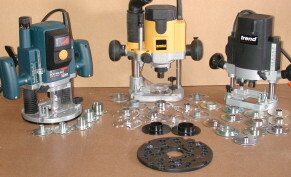 For easy fitting and use in a router table, the router should have a base plate with good visibility and substantial attachment points, a deep plunging collet, a simple switch (even though it should be operated via an NVR switch) and a height adjusting system that makes setting the depth of cut easy and accurate. The versatility of the router depends not only on the range of accessories offered by its own manufacturer, but also its suitability for use with other suppliers’ products. Always consider what accessories you are likely to aspire to and their suitability for use with your proposed router. 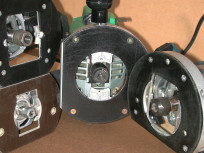 Different users will attach different weight to the various factors above. If you are considering the purchase of a router, it will be worth your while buying a copy of Routing which, in each issue, contains a Router Guide giving, for each router, information on all the factors discussed above. What is your intended use? Variable speed is essential for large-diameter heavy cutters. Will the router be used mainly in the hand? Will it be used for inlay work or freehand routing e.g. house signs? Are the collets of good quality? Is there a range of other sizes, and are these proper collets rather than reducing sleeves? Does the collet plunge through the router base? If not does it fall far enough short to create problems in the intended work? Is there a fine height adjuster built in? Available as an accessory? Are they simple, accessible and easy to use? Is the aperture big enough for most of the cutters you are likely to use? Is the visibility satisfactory? Are there substantial fixing points for attachment to a table? Does it have detachable rods, adjustable sliding cheeks, fine adjuster? Is there a good range of guide bushes? Will it be necessary to buy an adapter plate and use another make of guide bush? Is a dust extractor spout supplied as standard? Is it easy to attach and detach, does it interfere with the guide bushes, does it limit plunge depth, cutter diameter and visibility. Is the router easy to attach to a table? Is the collet plunge adequate? Is the base aperture big enough for the large cutters likely to be used in a table? Is the switch a simple one and is there a fine height adjustment?